How do I enter data into SPSS for central tendency and dispersion? 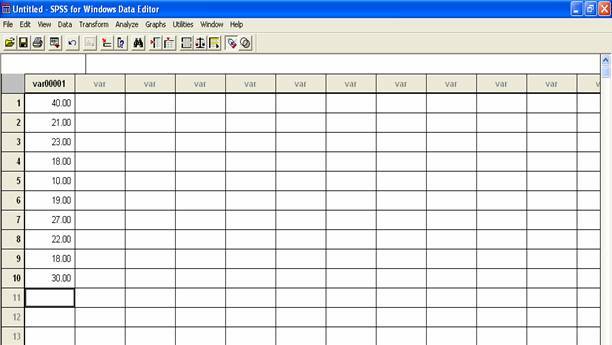 Home > How do I enter data into SPSS for central tendency and dispersion? You are going to love how easy this is. Especially if you have ever been asked to do these kinds of things by hand. I’m going to use this example to help you understand how to enter the data. You can follow along first and then enter your own data by using the same steps. Just change the data points of course. Suppose I want to describe the ages of 10 students in my class. Here are the students and their ages. Simply type in each age and hit the enter key. Every time you hit enter, the cursor will move to the cell below the one you are currently working in. In this example, you can see all of the ages in one column. For example, the number 40 in the top cell is the age of Veronica. The number 30 in the bottom cell is the age of Becky. This box will let you modify some things about your variable. This includes the variable name. Look in the Variable Name box. You can see that right now, the variable name is still var00001. To change the name, type another name into the box. Make sure the name is meaningful to you and that it describes your variable. Since I am giving an example about age data, I will name my variable Age. 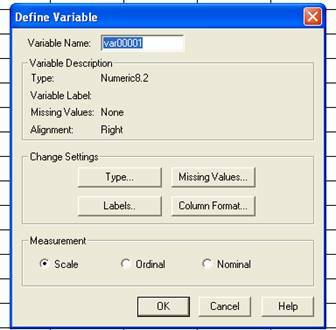 SPSS will set a limit to the number and type of characters that you type in. This means that sometimes SPSS will tell you that your variable name is too long. When this happens, shorten your variable name by taking out some of the letters, like the vowels. Sometimes SPSS will not let you use certain characters like the ‘$’ sign. When this happens, just take those characters out and try something else. You can see that there are a few other options in the Define Variable box. These include choosing a scale of measurement and changing some settings. We won’t worry about these options right now. When you are finished renaming your variable, click the OK button. When you click the OK button, your variable name will change. In this example, the variable name ‘age’ now appears where ‘var00001’ used to be. Notice how age is completely lower case – even though I had capitalized the ‘A’ initially. SPSS will change your name to lowercase letters. Don’t worry about it. It happens to everyone. Congrats! You have just entered data that can be analyzed for central tendency and dispersion. But wait. Most students think that they are finished when they name the variable. Not so. There is one last think to do and it is so important. Always remember to save your data file before doing an analysis. The reason for this is that SPSS makes 2 different files, one for your data and one for the results of your analysis. Students often lose their unsaved data files when they analyze their data. Don’t let this happen to you. Save your data to a meaningful place! It’s easy to save data. Click ‘File’ at the top left of the screen. Then Click ‘Save As.’ Your computer will give you some options for where you want the data to be saved. Pick an option that is meaningful to you and one that you will be able to access in the future. For example, if you are a student who is working in a university computer lab, the best place to save your data is probably a disk. If you do not have a disk and you are working on a university computer, save the file to the desktop of your computer and email it to yourself. If you are working on a personal computer at home, save the data file to a meaningful folder. Give your data file a name that you will remember in the future. Students often access the same data file over and over again to do many different analyses. Make sure that your data file has a name that is meaningful to you now. More importantly, make sure that your data file has a name that will be meaningful to you in the future. If you are working with Age data, you might name your data file ‘Age.’ This is very clear. Your data file will be given an extension. This is something that goes at the end of your file name. It can help you in the future when you are trying to determine what type of file you are looking at. 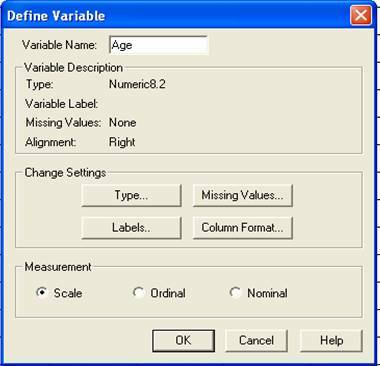 SPSS uses different file extensions for data files and files for the results, called output files The file extension that SPSS should give you for a data file is ‘.sav.’ So, if you have saved an Age file, it’s official name will be Age.sav. It’s easy to know if your file has been saved. Just look at the top left corner of the screen. If you have successfully saved your file, the name you chose will appear there. See the name Age in the top left of the picture below? That means my file has been saved with the name Age.